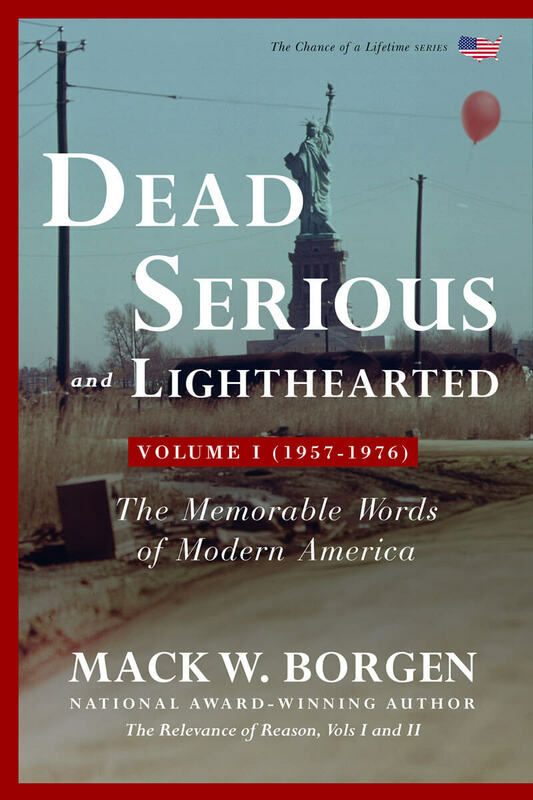 The Dead Serious and Lighthearted series is written without agenda, but it carefully identifies who said what and when and where – exactly. Its words can help us know our country; better remember who we are and from whence we came. In addition, each entry is carefully placed into the context of our nation’s history — whether the basis for such placement is rooted in the words’ humor, passion, eloquence, prescience, wisdom shock, even, or even foolery. 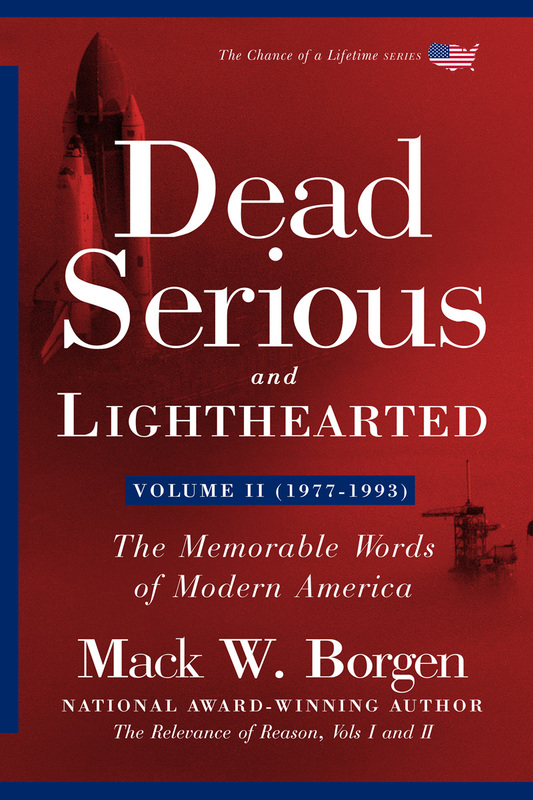 In Volume II, the second of the three-volume Dead Serious and Lighthearted, the Memorable Words of Modern America from 1977 until 1993 are presented – with each entry once again identifying the speaker or writer; with each entry carefully placed into context and explained as to meaning. Once again and as with Volume I, the memorable words include the fascinating and frivolous, the tragic and momentous, the eloquent and bumbling. From Star Wars’ “may the force be with you” to Nicholson’s “you can’t handle the truth;” from the lightness of Happy Days to the edginess of Roseanne; from the efforts of Carter to the rise of Reagan; from the Go-Go 1980s and the fall of Communism; from the emergence of modern conservatism to the impacts of globalism and technology. 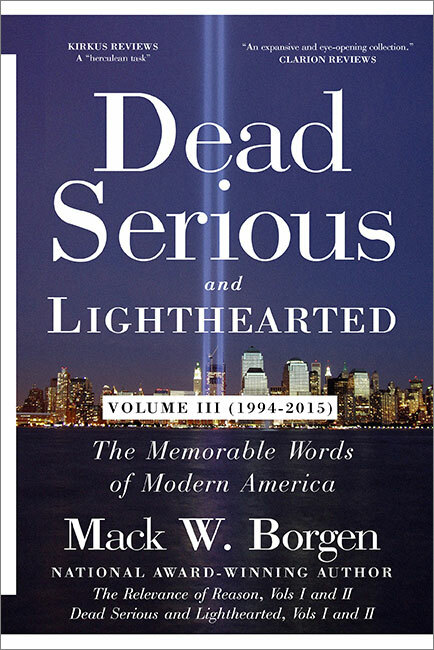 In Volume III, the last of the three-volume Dead Serious and Lighthearted series, the Memorable Words of Modern America from 1994 until 2015 are presented — with each entry again placed into context and explained as to meaning. As with the prior two volumes, the memorable words include the fascinating and frivolous, the tragic and momentous, the eloquent and bumbling. From Forrest Gump to 12 Years a Slave; from 9/11 to the Great Recession; from “don’t ask, don’t tell” to “hands up! don’t shoot; from “Mission Accomplished” to “Hope is not a strategy;” from the “Contract with America” to “Drill, baby, drill;” from the impact of “shock and awe” to the reminder that “politics ain’t beanbag” and the rise of Trump(ism). Our country remains a remarkable, unparalleled and bountiful nation, but there are too many Americans who have become grumpy and entitled; mistrusting and cynical; exhausted and withdrawn. And America has changed; some think not for the better. There are many reasons for this, one being that we are an incredibly diverse nation with widely varying perspective. Worse yet, we have not had access to the facts. We have tons of information, about everything from the political situation, our economy, social issues, our culture — pretty much every area of modern life. But the information is often presented with spin, bias and agenda or perceived through filters based on our age, gender, and experience. When it comes to seeking solutions, it is time for us to once again embrace our sense of perspective, our spirit, our confidence, and above all, our sense of humor. Standing on a solid foundation of education and experience, author Mack W. Borgen removes the tint from our lenses by presenting unvarnished data. He does not try to persuade or push a position. Rather, he simply brings facts to the fore and lets us determine what they mean. He suggests that by having access to objective reality makes it possible for us to regain our sense of community and our commonality. Best of all, we can — working together — make a significant difference. For those who love facts, care about the truth, and understand the power and the relevance of reason, this book delivers unyielding encouragement and the raw materials for creating a better future for us all. This book has a passion for setting the record straight. His book is a treasure trove of solid, fun, and at times even fascinating information we, as a people, can put to good use. For those who care about the truth and rely on the power of reason, this book delivers hope and a foundation for creating a better future for our country and our people. Facts and data about the nature and state of our own country have for too long been delivered piecemeal or through the filters of self-interest or conflicted purpose. This has led to many misunderstandings about our own country, and those misunderstandings, in turn, often harden into firm, fixed, and erroneous beliefs and convictions. But these misunderstandings are not necessarily rooted in any cold bias or intentional ignorance. To the contrary, knowing and understanding our own country is difficult. Perceptions of our own country are deeply affected by our own life experiences, by our respective ages and generational associations, by the subtle influences of parochialism and regionalism, by the focus of our studies and the varying levels of our education, by our capacities of reason and recall, by the nature of our employment, and by our race, ethnicity, religion, interests and inclinations. The Relevance of Reason – Society and Culture uses facts to lay the foundation for gaining a true understanding of where we really are. The books are available in both hardback and paperback. It would be greatly appreciated if you would order the books directly from this website’s store (See Book Ordering Tab) or by merely emailing the author at mwborgen@live.com. All book orders will be promptly processed and shipped by UPS or other commercial shipping. Alternatively, upon release all books are also available at Amazon.com and Barnes&Noble.com.